The hip is one of the body’s largest joints. It is a ball-and-socket joint. The socket is formed by the acetabulum, which is part of the large pelvis bone. 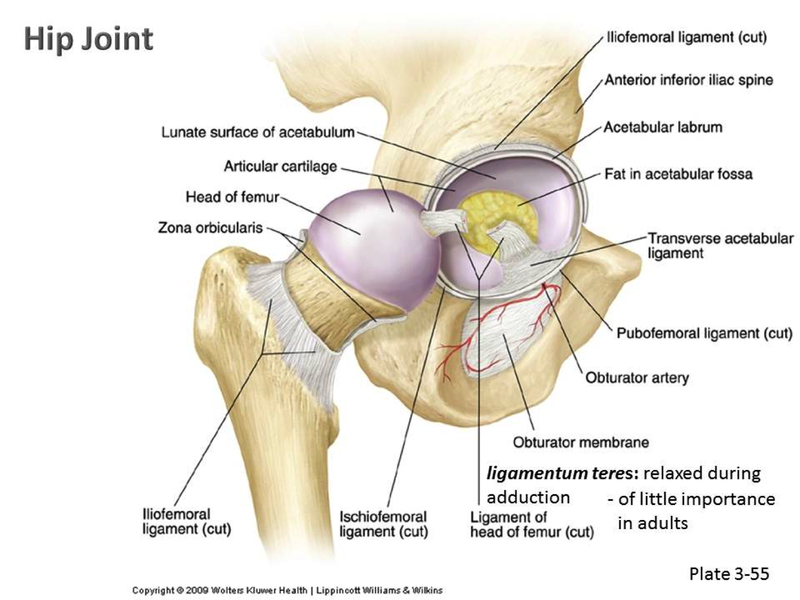 The ball is the femoral head, which is the upper end of the femur. Swelling of your thigh, calf, ankle or foot. Localized chest pain with coughing. After a total hip replacement surgery, an early physical therapy is very important for you to return to your normal life, doing your normal activities. The day after surgery, the physical therapist of the hospital where you are staying will come to your room and will gently mobilize your operated leg to soften your muscles and will demand you simple strengthening exercises. After this, he will ask you to seat at the edge of the bed and, if all goes well, he will ask you to stand up, with an aid of a walker, so you can lean on to it. After this, the physical therapist will lay you down on the bed again. This is very important because it permits you to have a vertical position. The next days, the physical therapist, besides keeping mobilizing your hip and strengthening you hip muscles, will teach you how to start walking with the aid of walking supports. Initially you will start walking with a walker, then moving on to two elbow crutches, then one elbow crutch and, finally, with no aids at all or, if you feel safer, a cane. 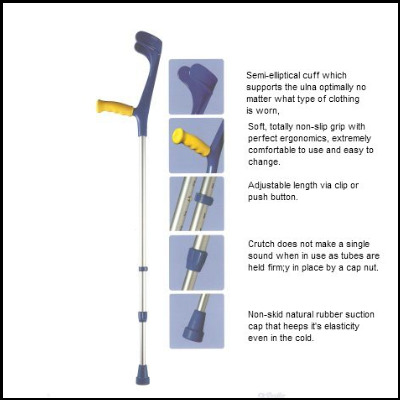 For a smooth walk with a walker you should advance your walker, then your operated leg and finally your “good” leg. For the elbow crutches, first of all, you need to know how to adjust your crutches. The grip should be at the same height as your hips, and the semi-elliptical cuff should be at three to four fingers below your elbow. The rubber cap should have a great adherence to the floor to prevent you from slipping. With two elbow crutches you should advance your two elbow crutches at the same level, then your operated leg, so that your foot will be between the elbow crutches, and then your “good” leg, a little bit forward then the foot of your operated leg. When you start to feel surer of yourself you can progress to an alternate walking, that is, you start by advancing the elbow crutch opposite to you operated hip and your operated hip, and then you advance the elbow crutch opposite to your “good leg” and your “good leg”. After you have done enough strengthening and mobilization of your operated leg, and if you feel ready, ask your physical therapist, in the hospital or in a clinic, if you can now start to use only one crutch. To use only one elbow crutch, your physical therapist will tell you to keep using the crutch in the hand opposite to your affected hip. With one elbow crutch you advance your operated leg and your crutch at the same time. Be sure to tell your physical therapist if you have stairs at home, so he can teach how to climb and descend them. To both climb and descend stairs, you should to do them step by step. To climb the stairs first you climb your elbow crutches, then your good leg and, finally, your operated leg. To descend the stairs you first descend your crutches, then your operated leg and, finally, your good leg. If you walk with only one elbow crutch and you have a stair rail, you can still descend and climb stairs with the crutch in the hand opposite to the hand rail. When you get out of the hospital, you still need to find a physical therapist to continue the rehabilitation of your new hip. Here is a video that shows you everything that I have just explained to you. I could only find videos with axillary crutches and not elbow crutches, but the principle is the same. Here is another video that I have found interesting because it shows at the end of the video a way of mobility that you can use when you are going to bed or get out of the bed. For a good and normal walk, you need to strengthen all of the muscles that surround the operated hip, so the joint can be as stable as possible when you walk. 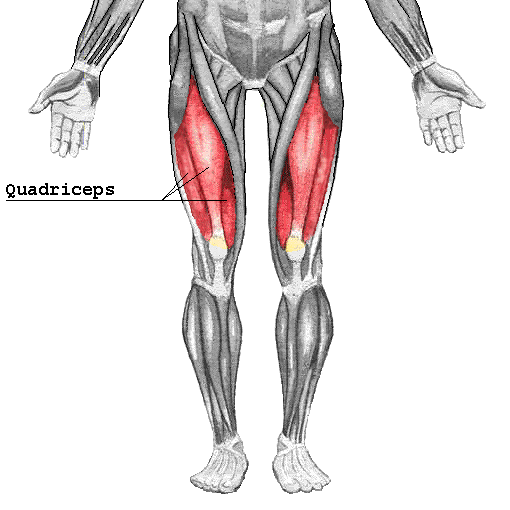 The most important group of muscles are the quadriceps, the hamstrings and the gluteus medius. 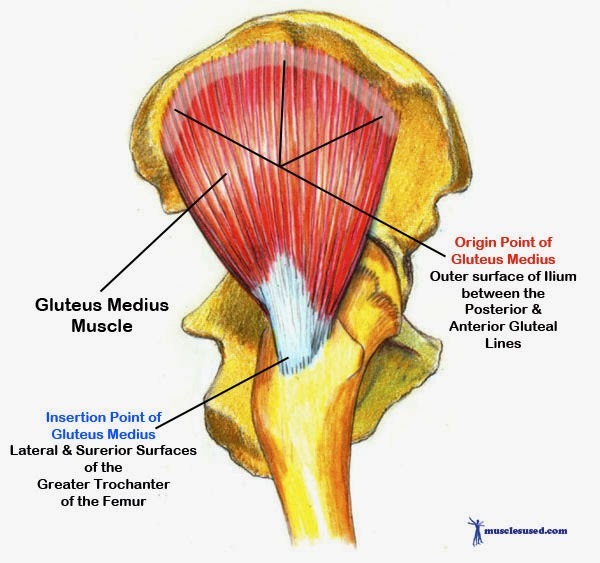 These muscle groups work together to support and stabilize the pelvic girdle. Without this support we would not be able to walk or move freely. Below I will show you some videos of simple exercises that you can do at home. Before doing any of these exercises at home, be sure to ask your physical therapist, for he is the only one that knows what your conditions are. He can also advice you of the weight-bearing you can or cannot do. You can do 3 series of 10 repetitions, resting between series. Later, if the exercises become easy, you can add a charge on your ankle, beginning in 0.5 Kg to 2 Kg max, progressin little by little. Ask your physical therapist if and when you can add the charge. For even better total hip replacement rehabilitation, it is also very important to do some balance exercises. You can do simple balance exercises at your home. All you need is a chair. You can support yourself in the back of the chair while you lift you good leg up, nice and gently. With your leg up, you can slowly remove your hands from the back of the chair. Be aware of keeping your hands near the chair, in case you lose your balance. When you are stable doing this exercise, you can try to do it with your eyes closed, if you feel stable. If that causes you excessively pain, stop what you are doing and consult your physical therapist before continuing. If not, repeat this exercise 3 series of 10 repetitions, resting between series. Like the strengthening exercises, check your physical therapist before doing these exercises, for balance exercises can be more dangerous if they are not done correctly or at the right time. If you cannot put 100% charge on your operated leg, you cannot do this exercise. 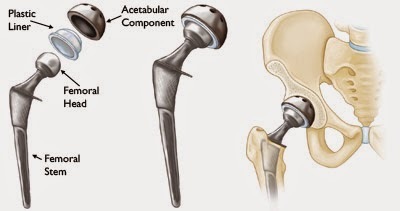 Swelling of the hip and leg after a hip replacement is normal. However, there are some things that you can do to minimize this problem. Ice the hip frequently, three times per day, 20 minutes each. Also ice after you have done your exercises. Lie down and elevate the leg on several pillows. To effectively reduce swelling, your foot should be above your heart. Do your ankle pumps. This makes your muscles help remove some of the swelling. Avoid prolonged periods of sitting. This occurs when the ball comes out of the socket. The risk for dislocating is greatest in the first few months after surgery while the tissues are healing. Dislocation is uncommon. If the ball does come out of the socket, a closed reduction usually can put it back into place without the need for more surgery. In situations in which the hip continues to dislocate, further surgery may be necessary. This is prevented by strengthening the muscles around the prosthesis and avoiding “false moves” or certain actions in the months following the surgical procedure. - Movements of internal rotation, like putting your shoes; movements of adduction of the hip, like when you are sleeping over the good side; or the two movements combined, like crossing of the legs when seated. To facilitate putting your shoes you can buy a shoe-horn. 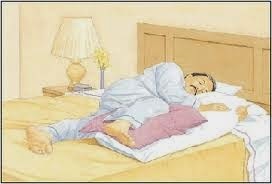 To prevent the adduction of the hip while sleeping, you can use a pillow between your knees. 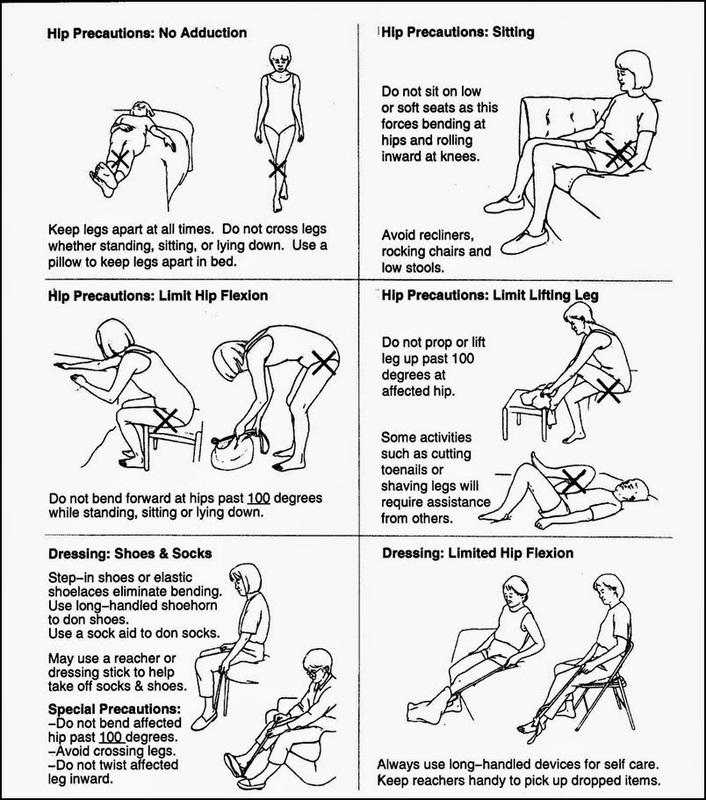 - Movements of flexion of the hip more than 90 degrees (lift your knee above your hip). That’s why you should never seat in a really low chair or crouch down to pick something of the floor. If you have to pick something of the floor, you move back your operated leg and you pick up the object in the floor, by bending the knee of the “good” leg, while you keep the operated leg extended. In the image above it says 100 degrees, but I advise you 90 degrees (sorry, it was the best image I have found). You are allowed to operate an automobile when you are comfortably walking with crutches and you have a good and comfort movement of the hip. But first, ask your physical therapist if you can start driving. To initiate driving, it is advised to practice in a place where there is no traffic, so you can move the foot of your affected hip between pedals at ease. To enter safely in the car, you should seat with the legs out of the car and pivot to the interior of the car. Removal of all loose carpets and electrical cords from the areas where you walk in your home. Physical therapy is the most important part of having a procedure done. I remember one Summer when my step-dad and I both had the same ankle injury from playing basketball just a few weeks apart. I was really focused on doing physical therapy and getting the work done as well as I could, but my step-dad didn't do any of his physical therapy. As a result, I healed quickly and completely, and he still had issues with his ankle over two years later. I hope that people think about that and remember to do their physical therapy. Email Appending list is continuously updated with most accurate, quality and verified contacts. · SIC /NAICS Code and NPI Numbers. This article is very much convincing and appealing. I have got to learn a lot from this article. You might be having the curiosity to know about our company and what business we are dealing with. If you are looking for the client list to achieve your business goals, E-Health Care Lists helps you in reaching that goal by providing you with the prepackaged and customized database which helps you to come across the qualified and interested audiences that places an immediate order for your products. Please refer to Therapist Email List & Mailing List for more information.